Investment casting is a versatile process, used to manufacture parts ranging from turbocharger wheels to golf club heads, from electronic boxes to hip replacement implants. The industry, though heavily dependent on aerospace and defence outlets, has expanded to meet a widening range of applications. Modern investment casting has its roots in the demands of the Second World War, but it was the adoption of jet propulsion for military and then for civilian aircraft that stimulated the transformation of the ancient craft of lost wax casting into one of the foremost techniques of modern industry. Lost wax casting has been used for at least six millennia for sculpture and jewellery. About 100 years ago, dental inlays and, later, surgical implants were made using the technique. World War II and then the introduction of gas turbines for military aircraft propulsion transformed the craft into a modern metal-forming process. Turbine blades and vanes had to withstand higher temperatures as designers increased engine efficiency by raising inlet gas temperatures. Initially, forged alloy steels were used but soon more heat-resistant alloys were needed, leading to the development of special nickel-base and to a lesser extent cobalt-base alloys, which became known as ‘superalloys’. Further alloy developments allowed turbine operation at even higher temperatures and greater efficiencies, but the materials became more refractory and less forgeable by traditional methods although becoming more costly to machine (particularly to the demanding airfoil configurations). • Costs had to be lower than for alternative techniques. It was the successful solution of these problems that laid the foundation for the modern investment casting industry. One buoyant niche market relies on special techniques (including hot isostatic pressing after casting) to produce components with fatigue strengths equal to forgings. Castings can now be made for applications with oscillating stress. Investment casting is used for a wide range of applications, figure 1. Small parts form the bulk of production, but very large components (with over 1.2m envelope edge and weighing over 250kg) can also be made commercially. Nickel and cobalt-base superalloys account for 50% of total output by value, steels (of all types) account for 35%, aluminium accounts for about 10%, and copper and titanium alloys make up a large part of the remaining 5%. Figure 1. 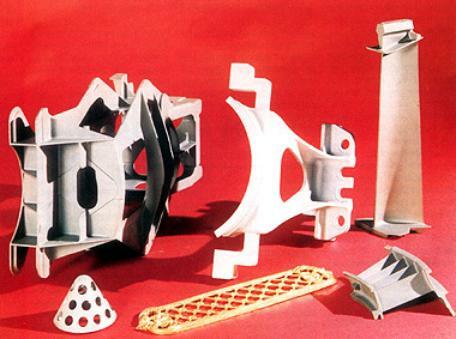 A range of components produced by investment casting. Gas turbine engine blades and nozzle guide vanes are exposed to very demanding conditions. Some of the most advanced materials and processes have been developed for such applications, which are now a major outlet for vacuum cast nickel-base superalloys. Complex coring technology to promote internal cooling is used routinely and effectively in blade applications. The metallurgical achievements of the directional solidification and single crystal techniques are used cost effectively in volume production, but most precision-cast airfoil components downstream of the highest temperature/pressure stages are still based on equi-axed castings. Large, complex thin-walled engine carcass parts such as diffuser housings and combustors are made by investment casting, producing parts up to 1500mm across and 600mm deep. These are replacing sheet metal fabrications, not only because they are more cost effective but because they also provide a high rigidity monolithic component with superior service characteristics. Investment cast integrally-bladed turbine wheels for smaller turbine engines, offering large cost savings over mechanical fabrications, have been widely adopted. Recently, demand has been growing for investment cast blades and fans to be used in land based turbines for power generation. Components are larger and operate at lower temperatures, but the growing demand parallels that for aero engine parts in the 1980s. This sector of the market has in fact sustained airfoil investment casters over the past few years when aircraft demand dropped. In a different field altogether, there is a long established market for hip replacement prostheses made from cobalt-base superalloys formed by investment casting. The variety of steels used and of parts cast has increased dramatically as designers and engineers have realised the potential of investment castings. The aerospace, armament, automotive, food, petrochemical, nuclear, textile, valve and pump, and other general engineering industries all use the technique. From golf club heads to gearbox parts for automotive applications, from bicycle cam forks to various gears and cam components, investment casting with wear resistant steels covers them all. Aluminium alloys are the most, widely used nonferrous investment castings, in the fields of electronics, avionics, aerospace, pump and valve applications and military command equipment. Originally light alloy castings were quite small, but much larger sizes - as much as 800-1000mm envelopes - are now regularly cast. Improved shell systems and casting techniques have allowed wall thickness to be progressively reduced in order to minimise weight. Interest in improved strength premium quality aluminium-silicon-magnesium alloy castings means casters can now offer castings for demanding applications, such as airframe components. Titanium alloy investment castings are produced for static structural applications requiring metallurgical integrity with high fracture toughness, at sizes up to at least 1250mm. In the US, 300-450mm long hollow compressor blades are cast in titanium alloy, and both the US and Japan manufacture titanium golf club heads! These form a substantial part of the titanium investment casting market. There have been numerous developments in the investment casting process recently, but the greatest change has come from the need to meet the environmental standards laid down in the Environment Protection Act. In shelling, the primary coat (which comes in direct contact with incoming molten metal) is a highly refractory material, typically zircon, applied with a silica sol water binder. In the US subsequent coats generally also have water-based binders but most UK and continental European foundries traditionally use alcohol-based (ethyl silicate) binders, generally with molochite-type stuccos (plasters). VOC emissions from these binders may exceed permitted limits, and many UK foundries are now changing to water binder systems. Rapid drying water binders are being introduced to prevent any slowing of production. Investment casting markets increased steadily over 40 years to the mid 1980s, when demands for new aircraft boosted both the sales of investment castings and industry capacity. The market continued expanding up to 1990, when annual worldwide turnover reached about £3,000 million. Over the next few years, aerospace and defence demands dropped and output decreased, in some countries by as much as 15-20%. Since 1994, however, general commercial demand has picked up and with recent aircraft orders turnover is approaching its previous high. Based on data published in early 1996, annual world turnover is estimated as £2,800 million. North America (essentially the US) accounts for about half, Western Europe a quarter, and the Pacific Rim countries 20%. Within Western Europe, the UK remains the biggest national producer with output of £300 million, followed by France (£185 million) and Germany (£135 million). Britain is home to about 50 of the 125 or so western European investment casting foundries, employing roughly 5,500 people in an industry which leads the European community. Investment casting is recovering lost ground. Commercial business is up, land-based power generation demand is buoyant and the aircraft market is increasingly active. Growth can be expected until the end of the century and beyond if the industry can promote itself well enough. European investment foundries should look to opening up the automotive market to investment castings. Realistic pricing of standard parts, however, can only come with sufficient automation to deal cost effectively with demand. But foundries will only invest in such equipment when orders are secured. Industry competition - particularly price competition - is intense and likely to get tougher. The process serves an international market in which there are growing imports from one region to another. Other materials and processes (especially other precision casting processes) pose threats. Superalloys have remarkable temperature capabilities through optimisation of composition, advanced processing techniques and complex internal cooling, but further developments are limited by the melting points of nickel and its alloys. To an industry so reliant on cast nickel-base superalloys, aluminide intermetallics, oxide dispersion strengthened materials and engineering ceramics are a serious threat. For the expanding aluminium sector of the investment casting market, traditional alloys will remain dominant. Reinforced composites, aluminium-lithium etc. will only find niche applications. Investment casters in the UK produce about 12% of world production, and by value the industry accounts for 13-14% of UK casting output (significantly more than steel castings). These are impressive figures and confirm the growing importance of investment casting. Source: Materials World, Vol. 5, No. 1. pp. 6-9, January 1997.